A routine visit from the Paediatrics to see how many toes and fingers that RJ has and of course we think nothing of it as this was our second child and we knew what was coming. That is until our Doctor calls for a second opinion when feeling RJ’s skull for any abnormalities. You kind of worry a little but think nothing could possibly be wrong with such a perfect specimen as this? Could there? 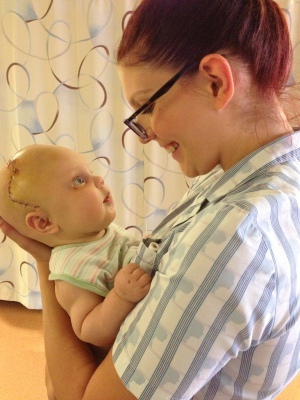 The verdict Craniosynostosis or premature fusion of the skull... Instantly the wind is taken out of your sails and you worry whilst you wait for the referral from paediatrics to the right department for these answers. To this very day, I thank my lucky stars for where we live as having the experts on craniofacial procedures for Australia in Adelaide. This made life so much better for us all. Not only that but to have the world leading surgeon Professor David David at our disposal instilled such confidence in our journey that was yet to come. Wow a 4 month old going under anaesthetics & having some of his skull removed. This is a scary thought but to be honest I couldn’t have felt more confident with who was looking after Ryder and how. We were very much a part of the process rather than an after thought, we were included in all meetings & decisions as to how we would proceed. Surgery 27th Nov things go almost to plan with a small bleed but nothing out of the ordinary so it’s off for recovery time in PICU. Seeing him for the first time post surgery was confronting but Ryder is my son so even though he was bandaged and had countless lines attached to him I thought he looked beautiful. The nurses and Professor briefed us as to how things had gone and what each line was for so we knew what was happening and we weren’t kept in the dark. 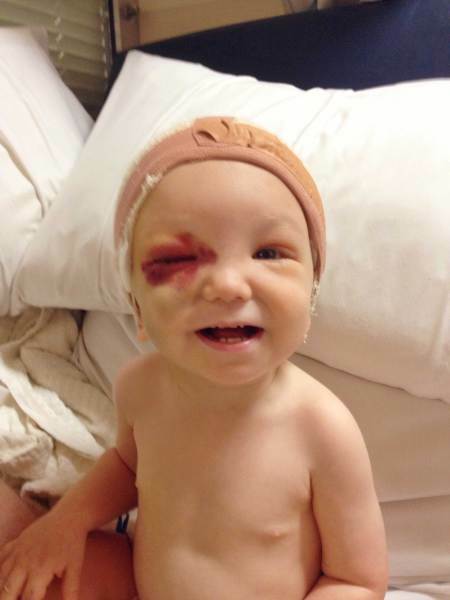 Ryder had terrors from the morphine which was not a nice way to see him, well that and the fact that each hour that passed his little eyes became more closed and more purple with bruising like he had been in some sort of infant gang fight. The more time passed the worse they got but we had been told this would happen. I tried to keep Ryder comfortable with a little toy monkey which I rubbed on his cheek to settle him throughout his time essentially being blind which lasted for around 48 hours.. Once Ryder could open his eyes again everything changed for the better. He instantly smiled being able to see again and oh dear more tears for a normally very unemotional daddy. Still a moment I will remember forever and definitely where you see leaps and bounds in recovery and progress for the better. Throughout the week in WCH we were visited regularly and honestly had the most beautiful nursing staff you could ever imagine having look after your baby on the ward . I believe one of the photo’s we gave to the foundation certainly demonstrates this with Ryder gazing into one of the nurses eyes completely in love with her. A little later in the week his head bandage is removed to show some more confronting vision of the enormous amount of stitches in his little head and well let’s just say a not really well shaped cranium. His head is still swollen and almost looks too heavy for him to hold up but he certainly seemed to have again turned a corner with his recovery again and all just within a week. Yes he is fragile and yes he is a baby but you see an amazing show of strength from somebody so apparently helpless in our eyes. His journey since his surgery has been amazing and his fighting qualities show more and more each day with quite the stubborn personality. Yes there are lot’s of appointments and follow ups but those have also had us thanking Craniofacial legend Professor David David every time we see him. Thankful for his skills when we see new children in his offices waiting for appointments knowing that they too are going to be ok. This whole entire process is scary for sure but when you are in the hands of this amazing surgical team and support staff who do this day in day out you can set your mind at ease and let them get on with what they do better than anyone else in the world. We are so lucky to have the world leaders here to help our children through adversity as well as us as parents who need one less thing to worry about in life should something like this occur. I personally can’t thank the team enough for making our gorgeous boy even more gorgeous. Professor David –A genuine hero! As the weeks and months went by the shape of Cruz’s head didn’t change. We tried for nearly a year to have it assessed by a range of GPs and paediatricians but just kept getting shrugged off. We were told if we placed the back of his head on a donut pillow when laying him down it would flatten out the bulge at the back; that his head shape would change naturally over time and, if it didn’t, well, we wouldn’t be able to get a hat or bike helmet to fit him but we’d just have to live with that! However, a few days before Cruz’s first birthday we consulted a new paediatrician about something unrelated. As soon as we walked into his office he asked who we were seeing about his head, and what was being done about it? I nearly fell off my chair! A diagnosis of craniosynostosis of the sagittal (central) suture of Cruz’s skull was confirmed by X-rays that afternoon. I began to do a lot of research now we had a diagnosis. We were devastated to learn that Cruz would need major skull reconstruction. 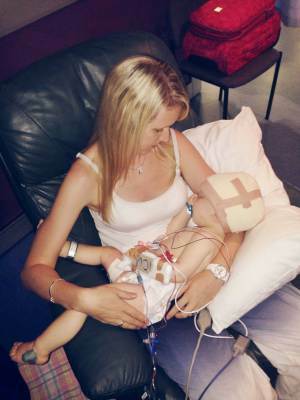 Such invasive surgery for a baby – and ideally it should have been done much earlier. How could this go undiagnosed for so long, especially after all the concerns I had expressed? 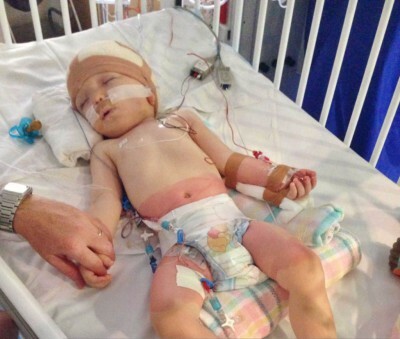 Cruz was referred to a neurosurgeon at our nearest children’s hospital in Sydney. 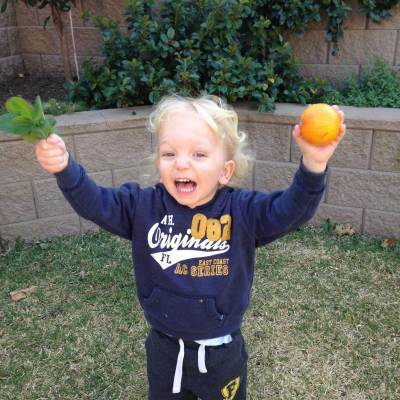 We consulted with them in early December 2013 and were met by the neurosurgeon and a plastic surgeon who proposed surgery for Cruz when he was around 18 months old. We had a real sense of urgency and this seemed too far away. We left uneasy and not at all confident. The main areas of expertise of the plastic surgeon seemed to lie elsewhere, particularly in the area of cosmetic surgery, not craniofacial anomalies. Through my research I found some wonderful support groups for craniosynostosis on social media. Networking with other families we heard of Professor David David and the Australian Craniofacial Unit (ACFU) in Adelaide. I immediately contacted Professor David and, although we had not yet met him in person, we felt such a sense of relief, sensed his compassion. We had complete faith that we had found the best care for our baby. By Christmas 2013 we had committed to taking Cruz to Adelaide for a month in February 2014. The wonderful staff at the ACFU took control of organising everything that was required. The collaborative approach by all of the specialists and care-givers of the ACFU assured us that they had Cruz’s best interests at heart and he underwent a successful Cranial Vault Remodel (CVR) on 4th March 2014. 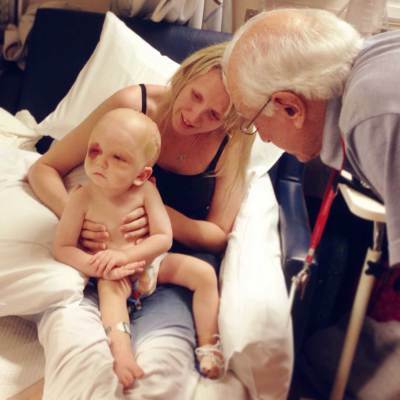 We are still amazed by the brilliant work of Professor David, Dr Cindy Molloy (Neurosurgeon) and the entire ACFU team – and by the progress Cruz has made since his surgery. Immediately after recovery we noticed him beginningto easily achieve milestones that he had previously struggled with or hadn’t accomplished. 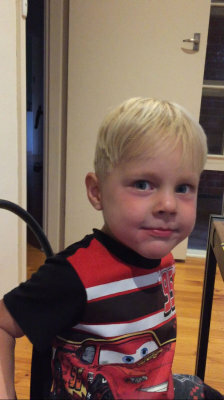 His brain now had room to expand and to process all these motor skills developments. We returned to Adelaide for Cruz’s twelve-month check-ups with all of his specialists. They were also most impressedwith his progress. At this point we don’t anticipate any further surgery for Cruz but it is reassuring to know that the ACFU team will continue to monitor him for many years to come, to ensure his skull is continuing to grow correctly and thathis brain is happy and healthy. From the beginning of Cruz’s journey with the ACFU we wanted to spread awareness of craniosynostosis and the very important and wonderful work that the Unit does. 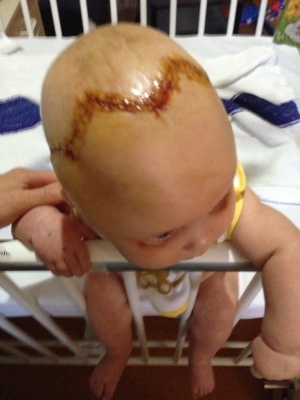 We set up a Facebook page called ‘Cruz’s Cranio Journey’ so that friends, family and anyone interested could follow Cruz’s progress, and a Go Fund Me account to help support Cruz and the Craniofacial Australia Foundation.